Upright floor plant 3 to 4-feet-high that grows as a dense clump. Leaves are leathery and variegated in shades of green, yellow and cream. 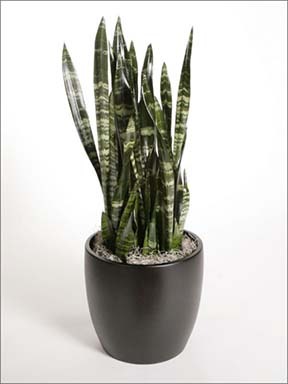 Most commonly used varieties of Sansevieria trifasciata: ‘Gold Hahnii’, ‘Golden Flame’, and ‘Black Coral’. 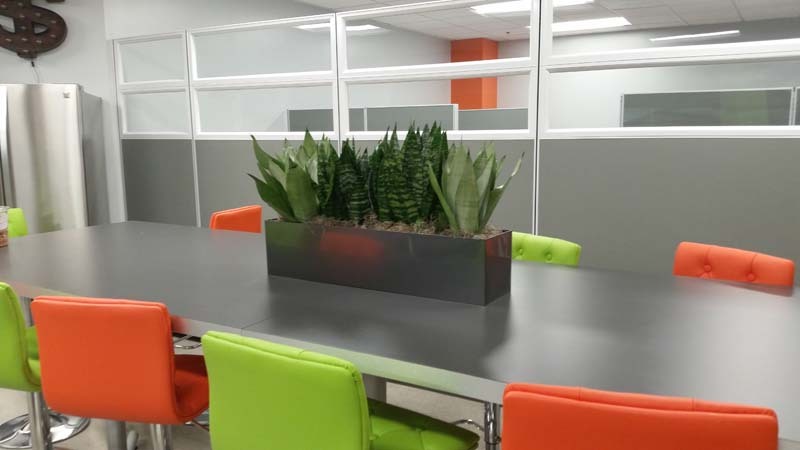 Commonly called by such names as mother-in-law’s tongue, snake plant and good luck plant, Sansevieria trifasciata are tough, thick-leaved, hardy plants for interiorscape use. In addition to their beauty and ease of care, they are often used as an air filtering plant because of their tendency to absorb certain poisonous substances. 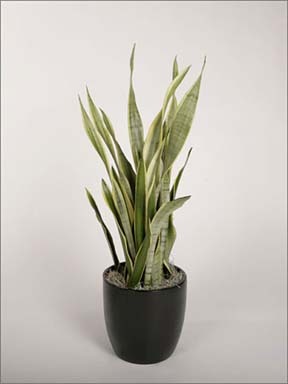 Sansevieria trifasciata are a group of succulents. There are about 60 related species in the Agave family from India, Indonesia and the dry parts of tropical Africa. Their succulent leaves allow them to survive in arid areas without water for long periods of time. Growth is comparatively slow, and the plants can last for many years in less than ideal situations. There are numerous species of the two main types: tall-growing plants with stiff, erect, lance-shaped leaves, and dwarfed-growing rosette forms. 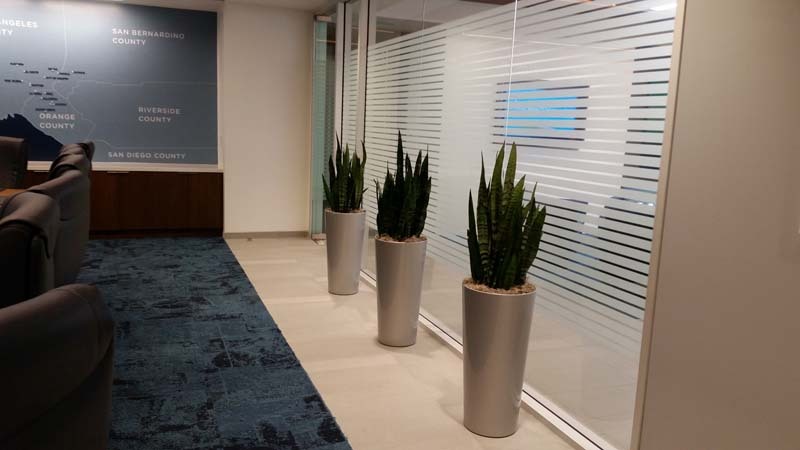 Sansevieria trifasciata is a species in the tall-growing group and is one of the most common Sansevierias used in the interiorscape industry. It is an evergreen herbaceous perennial plant whose stiff leaves grow vertically from a basal rosette. The mature leaves are dark green with light gray-green cross-banding and usually range between two to three feet in height. A variegated cultivar, ‘Laurentii’, with its golden-edged leaves is among the most popular of all. Most Sansevierias have an attractive marbled pattern on the foliage. The leaves rise directly from a thick rhizome that runs just below the surface of the potting media. Every leaf is tipped with a narrow shaped point, and care should be taken not to damage it; a leaf with a broken tip stops growing. Flowers – which appear only erratically and then only when the plant is grown in good light – are whitish or yellowish, narrow-petaled, in clusters on an erect spike. The flowers look like miniature lily clusters and have a pleasant smell, particularly at night. 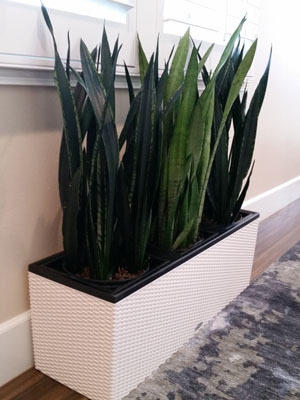 Sansevieria trifasciata like bright light and can stand plenty of direct sunlight. They will tolerate a certain amount of shade – for example, at a slightly shaded window – without detriment to their growth, but will virtually stop growing if they are forced to live in poor light for any length of time. In low light, they will eventually get floppy and start to lose their strong vertical nature. Take care not to overwater one in low light or you will soon have no roots to support the foliage. Also, plants that have been living in low light should not be moved to a sunny position without gradual acclimatization; sudden prolonged exposure to sunlight can result in leaf burn. Water thoroughly, then allow to dry out sufficiently. In low light (20fc – 100fc), allow to dry down three-fourths of container; in medium light, one-half to three-fourths of container. Symptoms of overwatering begin with blackening tips on leaf blades. Blades turn mushy and smelly from stem rot of the rhizomes (underground stem). Roots develop rot. Underwatering symptoms include yellow leaves with brown tips, shriveled roots and leaf blades, drooping foliage. Sansevierias have thick rhizomes for roots that store water for long periods of time. Growing media should be sufficiently dried down and leaf blades should feel spongy to the touch before adding water. Sansevierias like bright light and can stand plenty of direct sunlight. They will tolerate a certain amount of shade – for example, at a slightly shaded window – without detriment to their growth, but will virtually stop growing if they are forced to live in poor light for any length of time. Plants that have been living in low light should not be moved to a sunny position without gradual acclimatization; sudden prolonged exposure to sunlight can result in leaf burn. As natives of the dry tropics, these plants thrive in the warm environments. They like temperatures from 65-80 degrees best. Take care never to subject them to cold temperatures or sustained temperatures below 50 degrees. With their thick leaves they don’t mind the low humidity and can handle some fluctuations of temperature. During the active growth period water with a feast and famine style, giving enough to make the potting mixture moist throughout at each watering, but allowing the top inch of the mixture to dry out completely before watering again. During the winter rest period allow at least half of the potting mixture to dry out between waterings. Over-watering leads to rot and causes the large leaves of tall-growing types to topple over at the point where they join the rootstock. To prevent rot in rosette types, do not let water settle in the center of the plants. During the winter, especially in low light, only one light watering every couple of weeks will suffice. Let the leaves almost shrivel a bit between waterings to ensure they aren’t overly wet. Do not overfertilize these plants…they need very little. Apply a balanced fertilizer at half strength about half as often as you’d think. Do not fertilize those in low light. Fertilize the ones that are showing signs of growth during the active summer growth period only. Sansevierias are grown in a sandy mix. They do not mind cramped root conditions and in the interior environment it is best to leave them undisturbed for several years. It is advisable to add a bit of fresh soil once a year to help stabilize the foliage and to fill in air pockets. Fleshy, usually cream-colored roots will often appear on the surface of the potting mixture, but these plants do not need repotting until they crack their pots. Ideally however, they should be moved on shortly before reaching that stage. Sansevieria trifasciata rarely get insects. Common pests are mealybug and spider mites.